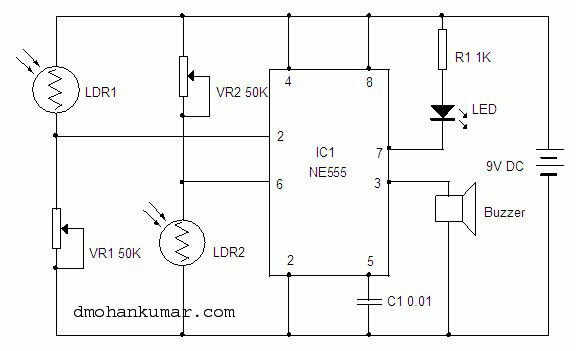 Here is an LDR based movement detector for day time use. It is highly useful in shops, banks etc to confirm the entry and exit of persons. It uses two LDRs and the popular timer IC555. The circuit exploits the Comparators and Flip-Flop inside the IC. LDRs are connected to the lower and upper comparator inputs. Ldr1 is to Resets the Flip flop and LDR2 to Set the Flip Flop. The Discharge input of the IC has an NPN transistor with an open collector. When the Flip Flop set, it sinks current and LED turns on. When the Flip-Flop resets, LED turns off. Thus it easy to verify the working of the Flip Flop. When the person crosses LDR1, the Flip Flop resets LED turns off but the output pin3 turns high and buzzer beeps to confirm the entry. When the person crosses LDR2, the Flip Flop sets and LED turns on and output turns low and buzzer stops. Thus the circuit resets for the second entry. Glowing LED thus indicates the Ready status. LDRs should be enclosed in black tubes to prevent false triggering. LDR1 should be placed near the entry side of the door and LDR2 to the inner side of door so that the space between the two LDRs will be around 1 foot.